Intel is slashing 12,000 jobs, or 11% of its workforce. The company said it's reorganizing toward more high-profit areas like the cloud. While that news initially sent the Intel stock price today down more than 1% immediately after the open, the news is actually bullish for the company. The tech titan will take a one-time charge in Q2 of approximately $1.2 billion as a result of the layoffs. But the company expects the job reductions to deliver $750 million in savings this year, and annual run rate savings of $1.4 billion by mid-2017. The job cuts and restructuring come as the PC market, Intel's lifeblood, continues to drag down revenue. After Tuesday's close, Intel reported earnings per share (EPS) of $0.54 on $13.8 billion in revenue. Analysts were looking for EPS of $0.48 on $13.83 billion in revenue. This is the first quarterly report under Intel's new financial reporting structure that underscores newer revenue streams. As the PC market sputters, Intel is relying on its other units such as high-price chips for data centers and the cloud. PC shipments suffered one of the worst years on record in 2015, according to Garter. In the first quarter of this year, shipments declined another 10%. Intel's client computing (PC) groups posted revenue of $7.5 billion in Q1, down 14% quarter over quarter and up a tepid 2% year over year. Since the late 1980s, Intel has provided the calculating engines for an expanding PC market. Thanks to rapid and steady growth, Intel stock surged over the decades as it reaped most of the PC chip market's profits. However, Intel has been slow to gain a foothold in the explosive mobile market. But Intel aims to change its perception as a PC company to one focused on "all connected devices that connect to the cloud." Intel is sharpening its focus on 2-in-1 hybrid PCs, which are growing more than 10% annually. 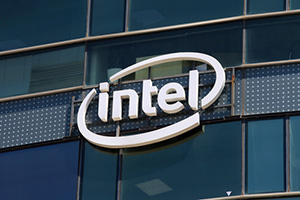 Intel will also expand its scale and scope in areas like gaming PCs, TV set-top boxes, data centers, memory, and connectivity. Investors will have to be patient to see some meaningful change in the Intel stock price. It will be several quarters before the restructuring shows results. Topeka is encouraged by Intel's restructuring initiative and believes the company is positioned to benefit from an intensified focus on growth areas like data centers and the Internet of Things (IoT). The firm is also encouraged by the stable margin profile and believes data center growth, continued manufacturing advances, and restructuring can provide an operating margin tailwind for Intel. Topeka rates Intel "Buy." Stifel noted Intel reported a decent quarter considering the soft PC market. As a result of the reorganization, the firm believes Intel will be able to realign resources and tap new areas of growth. Stifel added that given the recent Altera acquisition and many smaller acquisitions through the years, a workforce adjustment was overdue. Stifel rates Intel "Buy." In addition to solid growth prospects, Intel also engages in big share buybacks and boasts an attractive 3.3% dividend yield. Over the last three years, the Intel stock price is up 36.65%.